"Some prayed for help... Many wished for death… But in this city forever lost, the greatest secret still waits." And so opens the newest trailer of a period movie that chronicles a Gladiator slave and his lady love. This is a love story set amidst a calamity that destroyed an entire civilization. Directed by Paul W. S. Anderson, who brought us the Resident Evil series, Pompeii stars Kit Harington and Emily Browning as the lovers longing and fighting to be reunited. They are joined together by Kiefer Sutherland, Jared Harris as Lucretius, Jessica Lucas as Ariadne, Adewale Akinnuoye-Agbaje as Bridgageous, Carrie-Anne Moss as Cassia's mother, Paz Vega as Flavia and Joe Pingue as Graecus. 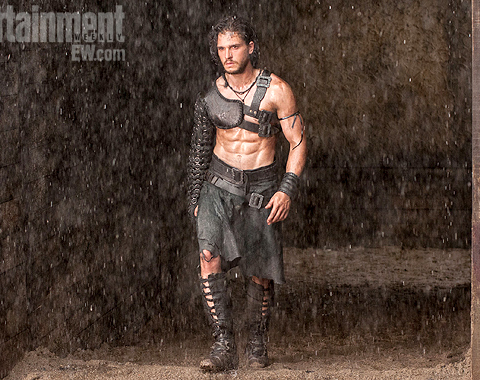 You can watch the teaser trailer of Pompeii below. A new movie still has also been released. And here's what Kit Harington, who is best known for playing Jon Snow in the Game of Thrones TV series, had to say about this picture. "This is the first scene you see me in. It’s set in London, in fact, and it’s a scene where my character is a gladiator fighting in an arena. That’s his gladiator look. It’s a great little fight against three masked gladiators and sets up who he is and where he’s going. You see me display my skills quite early on." 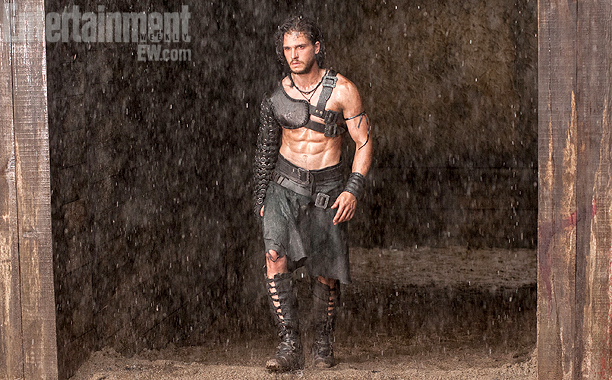 Director Paul W. S. Anderson's Pompeii will hit theaters on February 21, 2014.